San Antonio, Ibiza. Art Deco hotel mixing Cuban style and modern comfort near the beautiful bay of Cala Gració; just a 15-minute stroll from San Antonio's famous sunset bars and nightlife. Cubanito Ibiza Suites - Cuban style, modern comfort and the sparkling sunsets of San Antonio Bay - a winning formula for the Cubanito Ibiza Suites on Ibiza's west coast. Part of the Concept Hotel Group, this adults-only hotel takes its design inspiration from the vibrant Miami district of Little Havana. 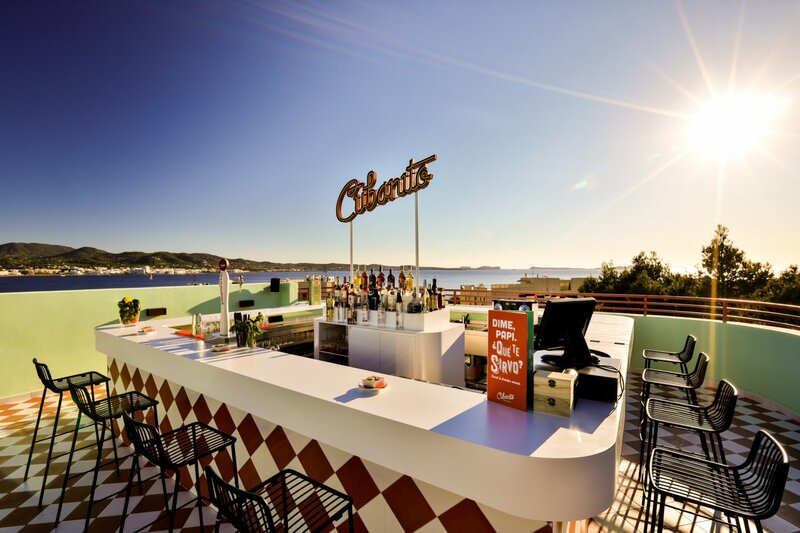 Guests can take advantage of the hotel's gorgeous rooftop bar on which to take in panoramic views of that sunset, whilst sipping on carefully-created cocktails or munching on a salad or sandwich from the snack bar. Daytime is all about lounging by the beautiful pool, either on one of the big super-comfortable Dreambeds by it or on one of the loungers directly in it, with feet dangling in the water. Each suite in the hotel pays tribute to an array of Cuban actors, artists and musicians. Stripped wood beds with overhead ceiling fans give that Havana look; small retro touches like the Marshall radio-style loudspeakers, Bakelite telephones and upholstered cocktail bars evoke ‘50s Cuba. A cool kitchenette with a Smeg fridge brings modern comforts. On some evenings each week there are cool events on the spectacular roof terrace like sunset sessions with Latin DJs and live bands or salsa nights, where a Cuban teacher shows you how to move to Latin sounds. Access the whole island with the hotel's concierge service, they organise hard-to-get restaurant reservations, excursions and much more for you. The hotel also makes a great location for all types of celebrations. The loved-by-locals beach of Cala Gració is just five minutes away from the hotel with the petite Cala Gracioneta right next to it. San Antonio with the famous Sunset Cafés and exciting nightlife is a mere 15-minute walk, though if you want to give your feet a rest, regular buses run from Cala Gració to the town centre in summer. Small ferries also connect the beach to San Antonio's harbour and other west coast beaches. Other hotels of the Concept Hotel Group are the Santos Ibiza Suites, Dorado Ibiza Suites and Tropicana Ibiza Suites in Playa d'en Bossa and the Paradiso Ibiza Art Hotel in the Bay of San Antonio.